How many times have you tried out a new recipe or simply an old one that did not turn out right? Did you eat it anyways, toss it or try to create something new out of it? There are times when mistakes cannot be remedied, but most of the time, if you just think creatively, a new dish can be created. Let’s take the old phrase “Necessity is the Mother of Invention” and turn it into something new. How about “Creations born of mistakes”? A recipe gone wrong need not be the only way that one dish can be turned into another. This series will deal with foods that you can create from leftovers, overabundance and mistakes. We are going to start with a Strawberry Marshmallow Cream Pie. Everyone loves Cream Pie and almost everyone loves Strawberries. Since it is almost always Strawberry Time in Southern California there are always vendors parked on the street, in front of the Post Office, in front of other stores, etc. Having purchased several boxes and having more than we could eat before they would go bad, I decided to make Strawberry Marshmallows with them. The reason I decided on Marshmallows is that #1 – I love Marshmallows! And there is nothing like homemade marshmallows. They taste nothing like the commercially made ones. They are light and fluffy and you can make them any flavor that you want. Plus I had an abundance of Egg Whites left over from making cakes that used only the yolks. Not having made Strawberry Marshmallows before, I didn’t want to increase thegelatin in the recipe before I tried it out as it was, except for the addition of the Strawberries. Of course, the Strawberries, once they were pureed, increased the liquid content of the Marshmallow mixture and consequently, the marshmallows did not set up completely. But once having tasted the concoction with a spoon, there was no way we could let it go to waste. 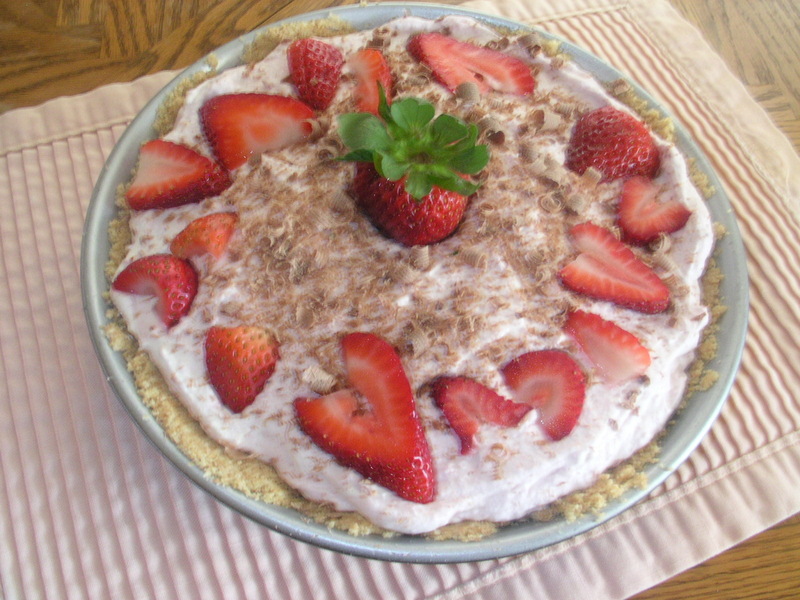 Therefore, I came up with the idea for a Strawberry Marshmallow Cream Pie. The crust is made from pulverized Vanilla Wafers with the addition of a small amount of butter. I made a Vanilla Pastry Cream to go in the bottom of the pie and then added sliced Strawberries to that. When I started to spoon out the Marshmallow mixture, I realized that it was so airy that by the time I got it into the pie shell on top of the pastry cream, that it would not hold its shape. To remedy that situation I whipped up a cup and a half of whipping cream and folded the marshmallow mixture into the whipped cream and then layered that mixture onto the pastry cream. To finish the pie, I placed some sliced strawberries around the edges (small whole ones or halves would be more elegant) and then made some chocolate curls for the top and placed a whole strawberry in the middle. Voila! We now have a delicious and beautiful spring or summer dessert. I still have Egg Whites and will make another batch of Marshmallows, although not strawberry this time, because by the time we eat the pie we will have tired of strawberries for a while. Look in your refrigerator and try to figure out what you can do with the leftover food in there. You will be surprised at what you may come up with! For the recipe for this pie please go to strawberry-marshmallow-cream-pie/. The Pie recipe and the Pastry Cream recipe will be there.